A lot of readers shared their memories at Seattle's old moviehouses following a recent story celebrating them. Seattle Times arts critic Moira Macdonald recently wrote about her love of the area’s historic moviehouses, prompting many of our readers to respond in kind with their own memories of films they saw and moments they experienced in those old theaters. Here are just a few of those comments. In the 50s and 60s, I would come up to Auburn, WA, to spend time with my grandparents, Elizabeth and Ralph DeSpain. A highlight of the trip was always going into Seattle for lunch at the Bon Marché, shopping for a back to school outfit, new shoes from Nordstrom, and a movie at one of the gorgeous theaters. Happy memories. Harvard Exit was my favorite theater back in the 80’s when I would drive down from Mount Vernon to spend the weekend. Great movies, with fewer explosions and more thinking required (The 4th Man and A Zed and Two Noughts come to mind). Sad to know it is gone but happy it’s part of my memory. I grew up in White Center, so it was either the Admiral or Lewis & Clark for me, and sometimes the single-screen Southcenter. I believe I saw my first movie at the Admiral, and my first grown-up movie (Butch Cassidy & The Sundance Kid) at the Cinerama. With the exception of the Grand Illusion, I believe I have been to all of the theaters in Moira’s piece. One theater not mentioned – the dome-shaped UA 150, where Star Wars opened. About the only movie theater I go to anymore is the Edmonds Theater. It’s run so well, it’s so cozy, and more it’s a vital part of the community. Is it arty and fancy? No. But it has an excellent projection and speaker system, and the best popcorn and personalities around. 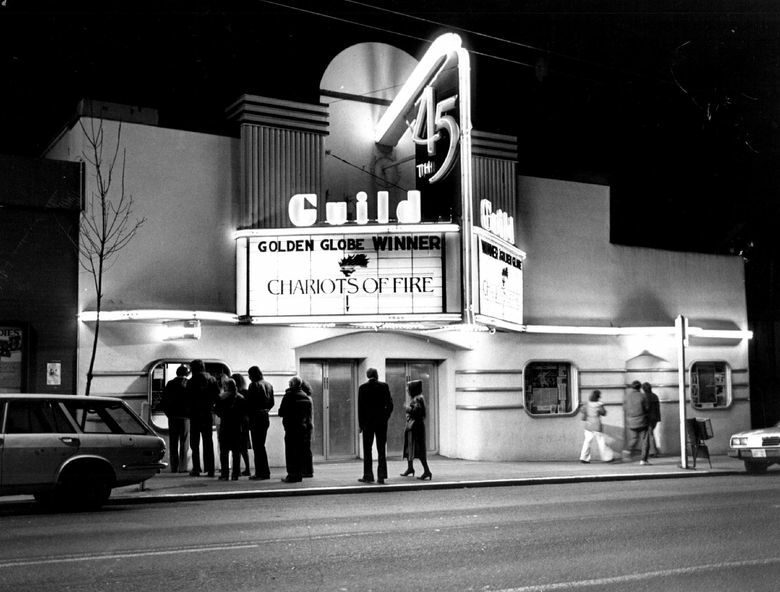 I used to change the marquee at the Guild 45 when I was about 14. Once a week and got paid about $5.00. I could see all the free movies I wanted but back then all they played were artsy films that a kid just wasn’t interested in. My younger brother still lives in Wallingford to this day. Great memories. I’m so glad you brought this up, Moira. My first “art house” movie was at the Grand Illusion, too. Two classic opening shorts—Bambi meets Godzilla and Thank You Mask Man followed by the feature, the quirky & charming King of Hearts. I remember just being blown away by all of innovative stories and cinematography. Over the years some of the most memorable movies I ever saw, with scenes that are with me to this day, were from art house theaters and is their biggest loss. Mephisto (Klaus Marie Brandauer), series on the movies of Bergman and Kurosawa, My Brilliant Career (Sam Niell and Judy Davis), Harold and Maude, McArthur’s Children, Diva, and on and on. It is the loss of the ideas & artistry in these movies that are the biggest loss to us as a culture. Yes, they and new ones are available on the internet somewhere, if you know where to find them or that they are there or have some source to sift through them to help ID the gems, which the theaters did for us. Seeing The Dark Knight at the Neptune at midnight was easily my best movie going experience. Used to live in Belltown back in the day and it was so great to be able to walk to The Coliseum or The UA, etc. and see a matinee or evening flick (and it was AFFORDABLE!). The Coliseum was getting a little grody there, toward the end. Does anyone know what the last feature was that played there before the transition to the Banana Republic? 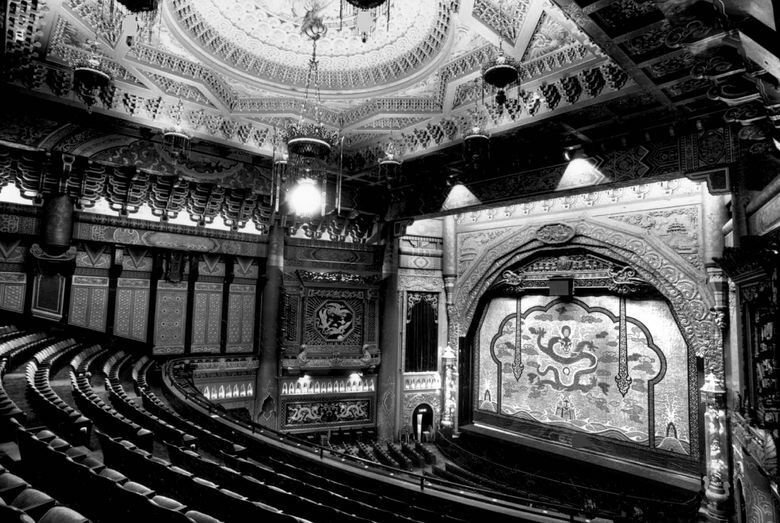 I certainly understand the dwindling movie crowd sitch these days and it’s a shame to lose these wonderful places, but, honestly, unless it’s a big effects film, I’d rather watch movies at home. No people talking, no cell phone screens lit up or people texting, no crying babies, no $10 buckets of popcorn, no parking issues, etc. That being said, few simple pleasures could match seeing a movie at The Harvard Exit on a rainy winter afternoon. Thanks for this article, Moira!